Prepare Sauce first. Heat Pulo Cuisine Mango Chili on medium heat with brown sugar until sugar melts. Stir and lower heat to low heat and let bubble for 5-10 minutes. Turn off heat and let cool. The sauce will thicken like a chutney. Cook your ground beef on medium-high heat until browned (remove any scum/fat), add veggies, raisins and seasonings plus 2 tablespoons of the sweet mango chili sauce, stir and cook together. Once done, set aside to let cool. As the meat and sauce cools, heat oil in a sauce pan for frying. Spread some flour on the table you will be prepping your pizza dough and some on your hands. This is important as pizza dough gets sticky and won’t spread well without some flour. Spread out pizza dough with hands and use rolling pin to create a 1/8″ thick rectangle. Using a pizza cutter, cut the dough into small squares. 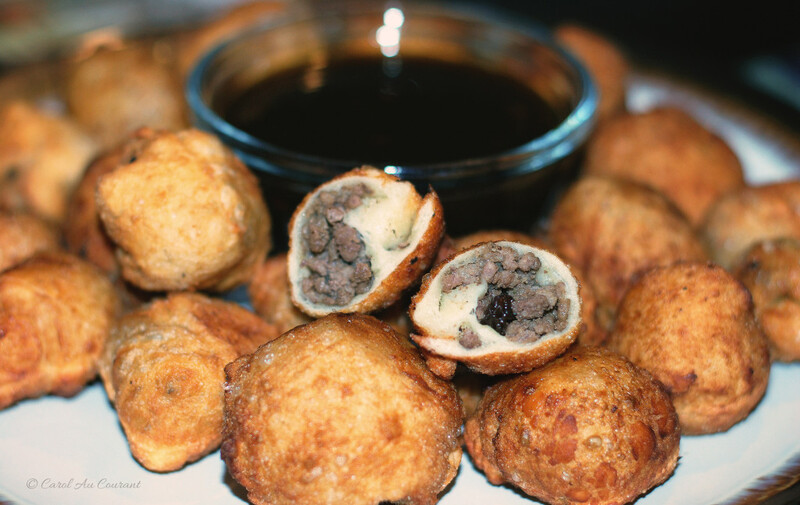 Spoon some meat into each square and fold over then shape into balls. Add 3-5 at a time to fry for 2-3 minutes. Let cool on paper towel to remove some oil then enjoy with the sweet mango chili sauce!Tip: You don’t want the oil too hot as it will cook the pizza dough on the outside too quickly and you will have uncooked pizza dough from the inside. The 1/8″ thickness of the dough is key in ensuring they will cook inside well.